ENGLEWOOD, Colo., Jan. 10, 2018 /PRNewswire/ -- DISH today announced that its customers will have the ability to watch Hands-Free TV™ using the Google Assistant in the coming months. This marks the first time that DISH customers with a Hopper, Joey or Wally can use voice to control their TV in multiple languages, including English and Spanish. "Throughout 2017, DISH took major strides toward building a suite of voice control options for our customers, including a new DISH voice remote," said Niraj Desai, DISH vice president of product management. "We're pleased to be working with the Google Assistant to offer our customers the ability to control Hopper's video experiences through the Assistant on speakers and phones." 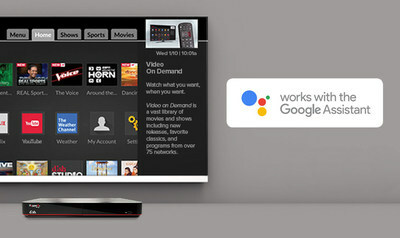 Starting in the first half of this year, DISH customers with a broadband-connected Hopper DVR (all generations), Joey client (all models) or Wally receiver can use the Google Assistant to control their TV when paired with the Assistant on speakers like Google Home, Android phones or iPhones. The Google Assistant will be able to help you navigate, play, pause, fast-forward, rewind and search TV content based on channel, title, actor and genre. In addition to the Google Assistant, DISH's voice control technology suite includes a recently released voice remote that ships at no extra cost with all Hopper DVRs.